Chiara Fumai, The Book of Evil Spirits, 2016, courtesy the artist and waterside contemporary, London. If you have ever played Ouija board then you will recognise the letters, numbers, and words that adorn the walls of Waterside Contemporary. The solo exhibition of Chiara Fumai welcomes the visitor with photographs of hands, each signing a different letter, and each addressing an anonymous message. The main piece is the video The Book of Evil Spirits, which portrays the artist as Eusapia Palladino, a famous Italian psychic in the late 19th century. 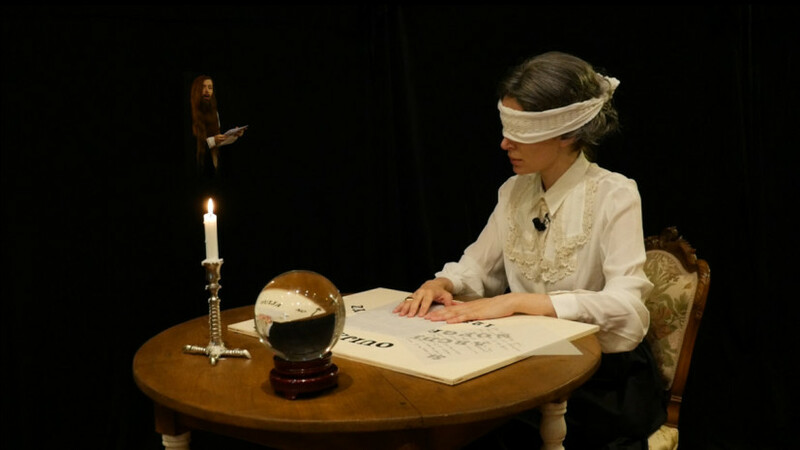 Fumai plays out the characters in the video: Palladino, the ghosts who visit her and the narrator – French scientist Camille Flammarion who studied Palladino to both affirm and discredit her. Figures also appear from Fumai’s previous performances, making The Book of Evils Spirits a work ghosted by its own retrospection. Palladino / Fumai dresses in traditional 19th century attire and sits at a table with her eyes covered, her hands across the Ouija board, waiting for a sign from the spirits. During the 20 minute-long video, she is then ‘visited’ by women that gain recognition by stating their dissent: writer and Red Army Faction terrorist Ulrike Meinhof; bearded lady Annie Jones; Italian feminist philosopher Carla Lonzi. All read relevant sentences from their writings. These spirits referred to as ‘evil’ in the title of the work represent the fears that society has of certain women and their ideas, but also they point to Fumai’s alter egos. Mixing historical characters, beliefs and realities, history and occultism, Fumai explores the human impulse to step aside from traditional, rational, and scientific orthodoxies to explore unknown and unfamiliar paths. 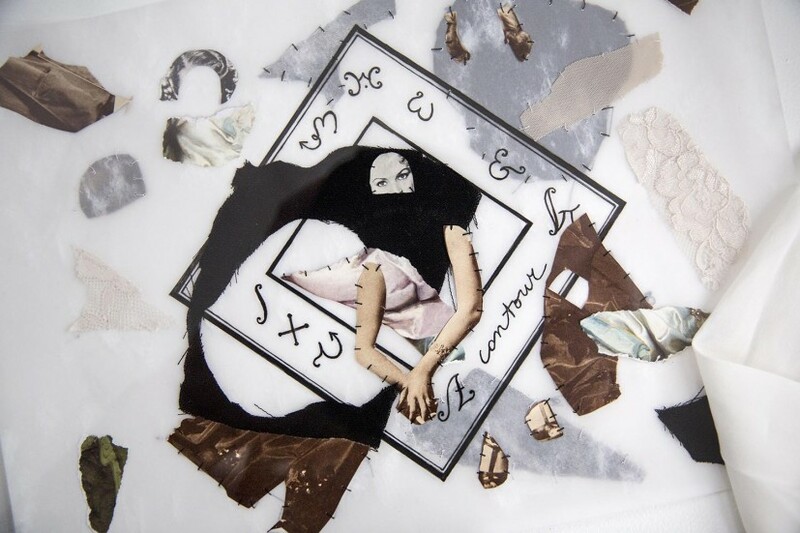 Display cases that accompany the video work present objects related to Fumai’s performance: wigs, clothes, hats, extracts from the letters of Ulrike Meinhof, a book by Carla Lonzi and embroidered collages. The objects function as records or documents for her performances and their material entanglement within history. On the walls two collages again relate to the video’s title by inserting the charts of anthropologist Cesare Lombroso, a founder of criminology and the author of an influential work on women and crime, La Donna Delinquente (1893). Lombroso examined the physical attributes (tattoos, cranial capacities, body shapes) of women in police stations, prisons and asylums to establish various ‘female criminal types’: the Criminal Woman, the Prostitute, or the Normal Woman, using Darwinian evolutionary science to argue that criminal women are far more dangerous than criminal men. Mixing Lombroso’s categories with found images of women from the 19th century and images of modernist architecture, Fumai reflects with irony on the rigid distinctions of categorisation and rationality. Chiara Fumai’s work often explores radical feminism, media culture, language, spiritualism and repression, mostly through performances. She has performed at the Whitechapel Gallery in London and participated in dOCUMENTA 13 with Moral Exhibition House, a work inspired by 19th century pseudoscientific fairground spectacles. Recent solo shows include: With Love from $inister at A Palazzo Gallery, Brescia (2013–2014); I Did Not Say or Mean ‘Warning’, Fondazione Querini Stampalia (2013). Recent group shows include Fiorucci Art Trust, London (2014); Stigter Van Doesburg, Amsterdam (2014); MUSAC Museo de Arte Contemporáneo de Castilla y León (2013); Muzeon, Moscow (2013). The artist was the winner of the ninth edition of the Furla Art Award (2013).